The right financing strategy should not maximize short-term valuations. Rather, it should systematically build a long-term sustainable valuation trend, consistent with the relevant value drivers of the business and the return requirements of the targeted investment community. So … do you happen to know somebody who could be interested in making an investment ..? During the last year I have met a number of interesting start-ups within sectors such as software, automation and healthcare. All of them had urgent need for growth capital, ... and none of them had thought through basic and essential themes of early stage financing – such as right pricing; correct timing; milestones for value drivers; ... and not to mention the key underlying essential point of maintaining sustainable value development. Well, good luck with that approach! The underlying problem is that without a plan for value development making it possible to obtain equity capital in later stages at increasing share prices, you are likely to end up with frantic funding efforts at e.g. 1/3 of your historical valuation. Naturally an almost impossible journey when your existing investors are frustrated and disillusioned. There is an alternative – based on the premise that the objective of an equity financing strategy is not to maximize the short-term share price potential, but rather to create a sustainable long-term valuation trend which is consistent with the relevant value drivers of the business and the return requirements of the targeted investment community. I can already hear the allegation: « … but that is exactly what we are doing». No, that is exactly what you are not doing! Because the correct logic does not start with the hypothesis of how much you can make somebody pay for the shares; it starts with the necessary rate-of-return which is required by your targeted investor community – in order to invest in your start-up with its existing risk characteristics. You need 5m initially (share issue #1), 10m in 18 months (share issue #2) and finally 15m another 12 months hence (share issue #3). Let us assume that the investor community (for this type of business risk) require a rate-of-return of 40% p.a. 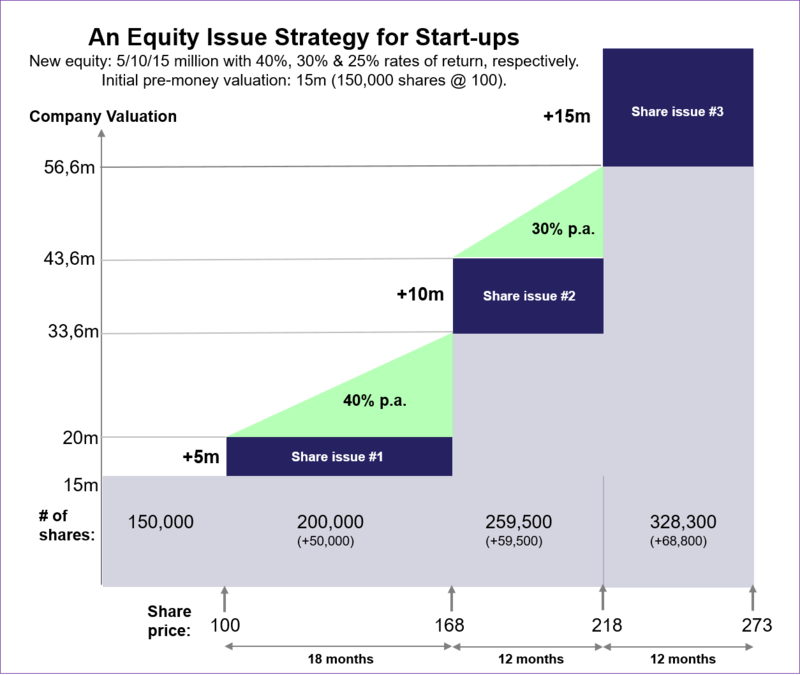 until share issue #2; then 30% until share issue #3; and 25% thereafter. These are normal return requirements for high-risk financing where maybe 3 out of 10 start-ups succeed. With lower risk, the required returns will also be reduced but with the same development over time. The share issue plan is illustrated in figure #1. Now, let us assume an initial (pre-money) valuation of 15m. The first catch is to assume that the value development of the start-up is identical to the return requirement. It is not, as the valuation subject to delivering returns must also include the equity of the share issues from the moment the cash has been committed to the venture. We start with the company having 150,000 shares – each with a value of 100 (15m). Share issue #1 is then for 50,000 shares (5m). After 18 months the share price should, due to the rate-of-return requirement, increase to 168 (40% over 1,5 years), and the start-up is now valued at 200,000 * 168 = 33,6m. Share issue #2 is now for 59,500 shares (at 168) for the planned next 10m. Prior to share issue #3 the share price increases to 218 (30% for one year after having reached 168) and the pre-money valuation is now 56,6m (259,500 * 218). Share issue #3 is for 15m with 68,800 shares (at price 218). So over the 2,5 years until share issue #3 these return requirements imply that the company must increase its valuation from 15m to 56,6m based on the cash resources of 15m from the first two share issues. That is a valuation increase of 41,6m and an annual valuation growth of 68%. Said another way: each unit of new equity must generate 2,8x of valuation increase. In my example the founders will own 46% after share issue #3. Starting with an initial valuation of 35m, this ownership stake will end up at 66%. Far better, don’t you think? ... But the 35m initial valuation corresponds to the value creation of the start-up going from 41,6m to 65,3m – and that each unit of cash must now generate 4,4x (vs. 2,8x). And the implicit requirement for annual valuation increase after share issue #3 (25 % p.a.) goes from 18m to 29m. These implications illustrate the challenges with casual comments from board members and unprofessional investors – not realizing the depth of their well-meant suggestions. The point is not what to wish for, but to be able to deliver sustainable valuation increases over a long-term period! The lack of satisfactory answers to these types of long-term financial planning issues, are what cause many new ventures to end up in situations with their share price falling to a fraction of prior valuations; and with existing investors unwilling to contribute additional capital. … Which is a hopeless starting point for further growth! Accordingly, a thorough financing strategy should be based on an holistic plan for sustainable valuation growth which coordinates the elements of business strategy, value drivers, valuation, timing, and the capital requirements of the new venture. Robust competitive advantages are created through the building of differentiating behaviors which are consistent with the buyers’ decision making process within the target segments. 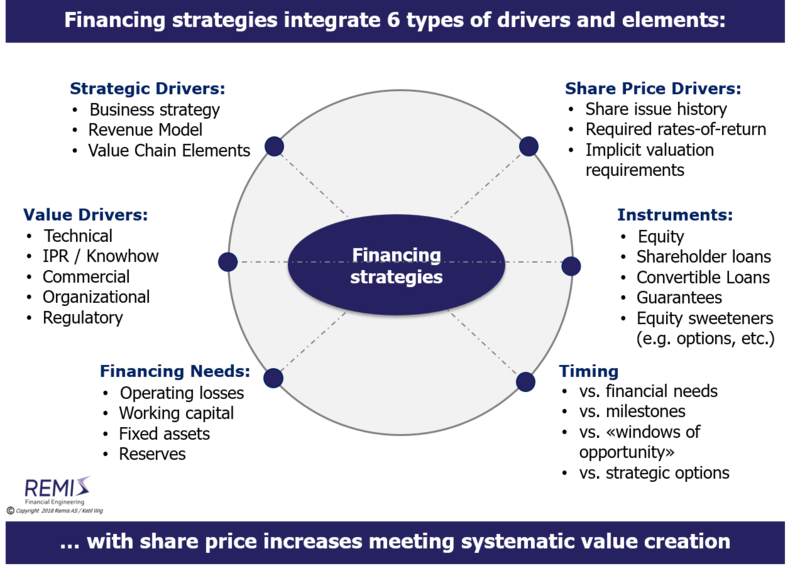 The value drivers are then the critical actions which drive the valuation of the new venture while building these differentiating behaviors – which is why the concept of value drivers are critically important when planning for the financing of start-ups. So the core of the challenge is then how the implicit expectation of valuation growth can be delivered between the rounds of financing – as in our example with the need for creating 18,6m worth of value during the first 18 months following share issue #1 (and prior to share issue #2). Now, let us examine the typical value driving tools available to start-ups for meeting such requirements for value creation. The key point is that measurable progress and achievable objectives for these value drivers represent step-wise valuation increases. Also, these situations correspond to strategic choices – usually aligned with alternatives for capital requirements and risk factors. Consequently, these are also the preferred times for executing rounds of financing. Figure 1 below illustrates an equity issue financing in three phases. Examples of value driver milestones may be: a working first prototype or MVP, or achieved cost objectives for a mass-production prototype (technical milestones); completed patent due diligence and feasibility studies, or granted patent (IPR milestones); satisfactory reliability – or customer tests (commercial milestones); recruited CFO or complete management team (organizational milestones); or granted authorizations or licenses (regulatory milestones). The financing strategy then includes deciding on a number of specific options; e.g. : type of investors, amounts of capital and the choice of financial instruments to name a few. Figure #2 shows the various elements of a financing strategy based on sustainable valuation development as a fundamental precondition. The choice of how to break down the value drivers into milestones suitable for financing, are subject to many pitfalls. Of primary importance is that the milestones need to be measurable and verifiable by external and independent parties in order to work towards investors. Take a typical commercial milestone like «accomplished breakthrough in customer segment A». It may work in a celebration speech, but is useless as a commercial milestone in an equity financing context, due to it not being specific or measurable. More meaningful examples may be specific customer orders or Letters-of-Intent; or the results of customer satisfaction surveys verified by third parties. The task at hand is to put together a mix of achieved milestones which together represent a good enough package in order to substantiate a value increase consistent with the equity share issue strategy (e.g. 33,6m of value prior to share issue #2 as shown in Figure #1, an increase of 18,6m in 18 months). The cash needs of a new venture fall into three categories: the funding of operating losses; investments in fixed assets; and the need for working capital. Of these requirements start-ups have a regrettable tendency to overlook the working capital requirements, but there are also a number of other miscalculations. The funding of operating losses shall cover operating expenses until the point of breakeven. The key pitfall is not to forget rather trivial costs such as salaries or office rent, but rather to underestimate one-time external outlays like prototyping, design, testing/verification, or the costs related to patenting. A value driver analysis should uncover one-time costs of this type. Beyond those, existing financing should generally be sufficient to support a minimum of 6-8 months of operational activities. The need for such a reserve implies having a source of cash for e.g., 10-18 months ahead, and then to initiate new rounds of financing when the reserve is down to 8-10 months of operational costs. Closing a round of financing usually takes 3-4 months of well-prepared effort (+/- 2 months). Consequently, it is a very risky proposition to start working on a new round of financing when the cash reserve is down to 6 months. Numerous desperate founders can verify this assertion. Fixed asset financing represent the cash outlays that are capitalized on the balance sheet, e.g. servers and IT infrastructure, laboratory equipment, production machinery, and other “hard” assets. Working capital is the financing of the commercial growth resulting in accounts payable and inventories. These elements represent two major challenges: The first is that the need for working capital financing is often omitted by unexperienced founders. The second is that supplier credit is overrated in start-up situations because of lack of credit ratings and the demand for cash-on-delivery terms by suppliers. With conventional business models, working capital usually represent 20-25% of revenues. A start-up may require up to twice as much until the suppliers are comfortable in providing industry-standard credit financing. In an early growth phase of a start-up which is running with an operating loss of 500k per month, the financing round should start when the cash reserve is down to 4-5m. (8-10 months of operating losses). Assuming 4 months until breakeven and a revenue increase of 10m over the coming 12 months, the funding should include 2-2,5m for loss coverage and 3m+ for working capital needs. One-time expenses and fixed asset investments represent additional requirements. There is a difference between determining the financial requirements and then deciding on the relevant source of financing and its type. Permanent financial requirements should be met by equity. In a start-up situation, more temporary needs may also require equity financing, but not necessarily through share issues. Some more creative options may for example, be to use shareholder loans for temporary requirements, or asking the owners to offer temporary guarantees towards important suppliers. Such financing extensions may be compensated through commissions or extra interest, or the use of call options or convertible loan mechanisms. A convertible loan is combination of a conventional loan and an option. An option is a right (without the obligation) to purchase a share at a fixed price (the “strike”) during a pre-determined time period. Even if the current share price is lower than the strike, the option has a time-dependent positive value based on expected share price fluctuations and probability theory. A convertible loan has option characteristics and therefore represents an additional value for the investor beyond the nominal value of the loan itself (depending on the convertible loan terms). Both convertible loans as well as conventional options are therefore suited for providing investor incentives in growth situations where the value of the underlying share may show significant variations in price over various financing phases. The paramount pitfalls of start-ups and early stage financing are arbitrary valuations without headroom for sustainable value development; closely followed by the use of inappropriate financing milestones. Then add systematically underrated needs for working capital and one-time external project costs – and the unfortunate fact is that most start-ups begin their fundraising efforts far too late when one considers their financial reserves. The current wave of innovative engineering and start-up incubators in Northern Europe is impressive. However, the predominantly casual approach to start-up equity financing much less so! For a full pdf version of this article, see White Paper #8: The Funding Journey - Equity Based Funding of Start-ups and High Growth Situations. Also read the separate article on Developing High Quality Business Models; on Strategy and the Use of M&A, on Strategic Alliances and Joint Ventures, on Synergies and Poor Judgment, on Buy-Side M&A, on Sell-Side M&A, on Financial vs. Industrial Ownership, and about M&A Process Management. See Download Center: White Paper #1: Post-Merger Integrations - About Synergies and Poor Judgment; White Paper #2: Strategy - and the Proper Use of M&A Tools; White Paper #5: Buy-Side M&A (mergers and acquisitions); White Paper #6: Sell-Side M&A (divestitures, trade-sales and mergers); White Paper #7: Should You Choose Financial or Industrial Investors/Owners? ; or White Paper #9: A 15 Step Recipe for Developing Your High-Quality Business Model.